Commemorating 50 years of AMG in India, the Mercedes-AMG GLC 43 Coupe is an all-new product in India powered by a 3-litre V6 engine and the COMAND Online connected car interface. 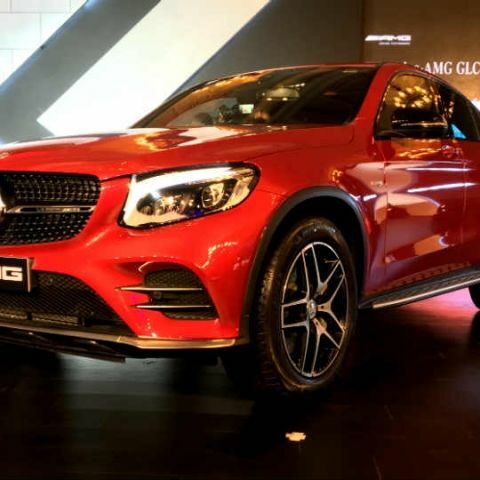 Mercedes-Benz India has launched the Mercedes-AMG GLC 43 4MATIC Coupe in the country. The performance-oriented SUV is an all-new product and comes without a predecessor, joining the GLC 300 and GLC 220d SUVs in India's GLC portfolio. The AMG edition GLC coupe is priced at Rs. 74.80 lac, and is powered by a 3.0-litre V6 bi-turbo petrol engine that produces 367 brake horsepower and 520Nm of torque. Joining the powertrain are a 9-speed automatic transmission, Nanoslide cylinder coatings (borrowed from Mercedes-AMG F1's portfolio) and an impressive array of technology as well. The Mercedes-AMG GLC 43 Coupe gets a speed-sensing electromechanical steering wheel with active steering power assistance. It also has a rain- and obstruction-sensing sunroof, intelligent LED lighting system, and includes a large 8.4-inch COMAND infotainment display on the central dash. The on-board infotainment system includes the standard entertainment functions, an array of input sources including aux, USB, SD cards and wireless (Bluetooth), along with integrated 3D navigation system and adjustable driving dynamics. All of these features can be accessed from the central infotainment display, or from the multifunction display mounted on the instrument cluster. The multifunction display has intelligent adaptive mode to show information and icons depending on driving speed. In terms of advanced driving equipment, the Mercedes-AMG GLC 43 Coupe gets driver attention assistance, tyre pressure monitoring, adaptive braking, assisted parking with 360-degree cameras, hill-start assistance, adaptive climate control, intelligent multi-LED ambient lighting and Comand Online connected car interface. The driving modes in the Mercedes-AMG GLC 43 Coupe include Individual, Comfort, Slippery, Sport and Sport+. These modes give control over the car's variable dynamic control system that gives individually adjustable suspension, power, steering, transmission and climate control options to enthusiastic drivers. The performance coupe also includes multi-way adjustable front seats with 4-way lumbar support, and the premium upholstery package includes man-made Artico leather to add a dash of luxurious appeal.